This small skipper is a close relative of the more common Chestnut Bob (Iambrix salsala salsala). The distinguishing features that separate the two species are (1) the spot on space 5 of the hindwing, which is placed midway between the cell end and the termen of the hindwing and (2) the distinctly orange apical area on the underside of the forewing. 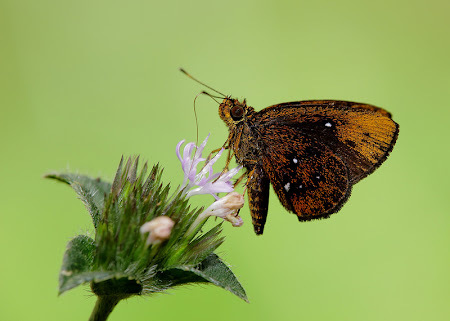 This shot, taken by ButterflyCircle member Koh Cher Hern, shows a Starry Bob feeding on the purple flower of the low-growing weed, the Elephant's Foot (Elephantopus scaber), which appears to be relatively popular with smaller butterflies.